Country music for the cause! 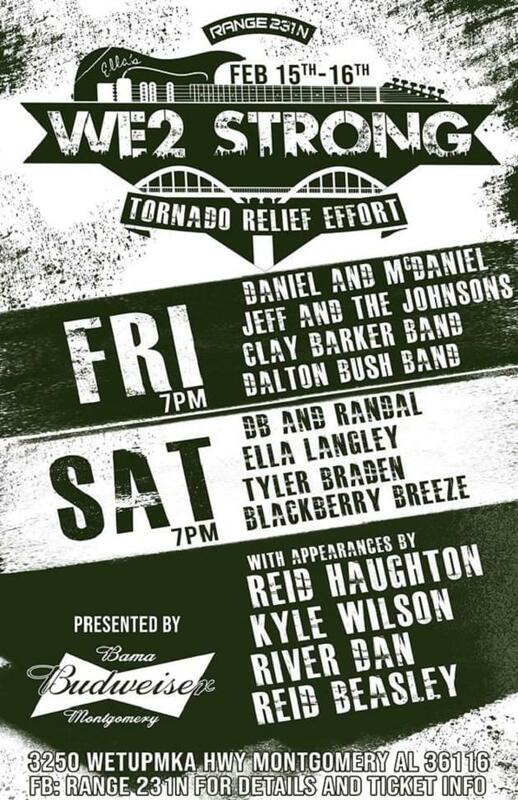 A healthy list of artists have jumped on the chance to play at the 2-day weekend benefit called WE2 Strong to support Wetumpka tornado relief efforts. It’s happening at Range 231 on Friday (February 15th) and Saturday (February 16th), with music starting at 7pm both nights. More info on the 2-night concert event can be found by clicking here. Also coming up, WE2 Strong 5K on Saturday, February 23rd at Gold Star Park in Wetumpka. Get more info on Ella Langley’s Facebook page by clicking here.